Before executing wann_tools, you should cp the wt.in file in the directory wannier_tools/example by your own necessary. For version later than 2.0, we updated the format of wt.in. The input file is structured in a number of NAMELIST and INPUT_CARDS. TB_FILE, LATTICE, ATOM_POSITIONS, PROJECTORS and SURFACE are the necessary basic parameters. They are used by almost all functionalities listed in CONTROL namelist. There are 4 NAMELISTS included in wt.in. They are TB_FILE, SYSTEM, CONTROL, PARAMETERS. If you want to comment one line, please use ‘!’ instead of ‘#’, because our codes were written in Fortran. Set the filename of the tight-binding Hamiltonian. At present, we use the format of wannier90_hr.dat specified in Wannier90. The default value for Hrfile is ‘wannier90_hr.dat’. You could specify the first-principle package that used for obtaining wannier90_hr.dat. Default value for Package is ‘VASP’. We support VASP, QE, Wien2k, OpenMx, Abinit at present. Please report new software package to me if you needed. Package is very important if you use QE to generate your tight binding model. Because the orbital order in QE is different from VASP, Wien2k et al.. And it will affect the results of spin texture. If you got strange spin texture, please carefully check this tag. In this namelists, we specify the system you need to compute. NSlab : integer, Number of slabs for slab band, The default value is 10. NSlab1, Nslab2 : integers, The thickness of nano ribbon. If you don’t want to calculate the band structure of it, then don’t set it. The default values are Nslab1= 1, Nslab2= 1. 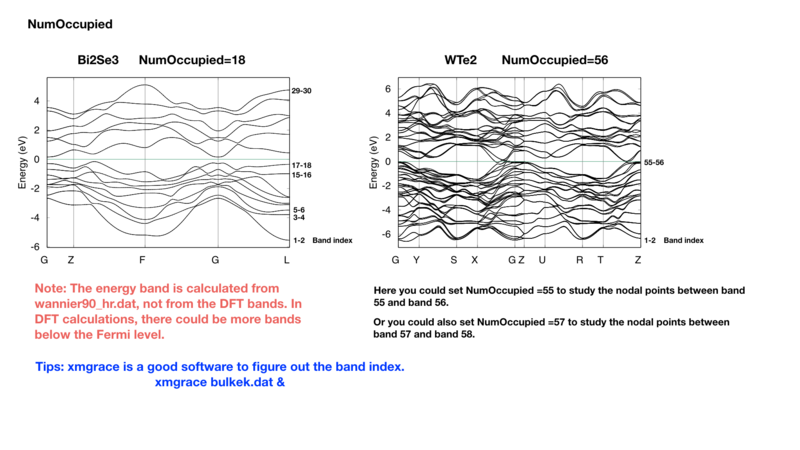 NumOccupied : integer, Number of occupied Wannier bands. No default value. Important: please set NumOccpuied correctly. It represents the “occpuied” wannier bands, not the total number of electrons. In the calculation of Wilson loop, the Wilson loop is the trace of NumOccupied bands. If you want to study the topology between the 8th and the 9th band, then set NumOccupied=8. When you search Weyl points, nodal line or study the gap in some k slices, NumOccupied is also a very important. WannierTools will look for touching point or calculate the energy gap between the NumOccupied’th band and the (NumOccupied+1)’th band. When you calculate the Fermi surface with BulkFS_calc= T, In order to save the storage, WannierTools only writes out 8(16) energy bands around NumOccupied’th band for SOC=0 (SOC=1) system into FS3D.bxsf. If you don’t put any physical meaning into this tag, then it is very easy to understand. SOC : integer, Flag for spin-orbital coupling. If SOC=0, it means there is no SOC included in your given tight binding model. if SOC=1 or >0, it means SOC is already included in the tight binding model. E_FERMI : real-valued, Fermi level for the given tight binding model. Bx, By, Bz : real-valued, magnetic field value. Ignore it in this version. surf_onsite : real-valued, Additional onsite energy on the surface, you can set this to see how surface state changes. But don’t set it if you don’t know what it is. In this name list, you can set the keywords to setup the tasks. All these tasks can be set to be true at the same time. We listed those features in the table below. In this namelists, we listed some parameters necessary in the task you specified in namelists CONTROL. E_arc : real-valued, energy for calculate Fermi arc, used if SlabArc_calc = T. The default value is 0.0. Eta_Arc : real-valued, infinite same value for broadening used in Green’s function calculation. used if SlabArc_calc = T. Default value is 0.001. [OmegaMin, OmegaMax] : real-valued, energy interval for surface state calculation. used if SlabSS_calc= T. No default value. OmegaNum : integer valued, Number of slices in the energy interval [OmegaMin, OmegaMax]. used if SlabSS_calc= T. The default value is 100. Nk1, Nk2, Nk3 : integer valued, Number of k points for different purpose. I will explain that later. Default value is Nk1=20, Nk2=20, Nk3=20. NP : integer valued, Number of principle layers, see details related to iterative green’s function. Used if SlabSS_calc= T, SlabArc_calc=T, SlabSpintexture_calc=T. Default value is 2. You need to do a convergence test by setting Np= 1, Np=2, Np=3, and check the surface state spectrum. Basically, the value of Np depends on the spread of Wannier functions you constructed. One thing should be mentioned is that the computational time grows cubically of Np. Gap_threshold : real valued. This value is used when you do energy gap calculation like BulkGap_cube_calc=T, BulkGap_plane_calc=T. The k points will be printed out in a file when the energy gap is smaller than Gap_threshold. The second important format in wt.in is the input_card format, which is relatively fixed format. First, we need a keyword like LATTICE, which is name of this card. After this keyword, the number of lines is fixed until it is done. There are several INPUT_CARDS in the wt.in. There is no order between the INPUT_CARDS. And any comments or blank lines could be added between the INPUT_CARDS. Lets introduce them one by one. In this card, we set three lattice vectors coordinates. For the unit, you can use both Angstrom and Bohr. However, in the program, we use Angstrom. Bohr unit will be transformed to Angstrom automatically. No default values for the LATTICE CARD. In this card, we set the atom’s position. 1. Here the atom means that the atoms with projectors. not the whole atoms in the unit cell. 2. You can use “Direct” or “Cartesian” coordinates. “Direct” means the fractional coordinate based on the primitive lattice vector listed in LATTICE CARDS. In this card, we set the Wannier projectors for the tight binding. Here we don’t take into account the spin degeneracy, only consider the orbital part. The name of orbitals should be “s”, “px”, “py”, “pz”, “dxy”, “dxz”, “dyz”, “dx2-y2”, “dz2”. I will add f orbitals latter. The order of the orbitals is very important if you want to analyze the symmetry properties. The default order in Wannier90 is “s”, “pz”, “px”, “py”, “dz2”, “dxz”, “dyz”, “dx2-y2”, “dxy”. You can find the orbital order from wannier90.wout. If you don’t care about the calculation related to symmetry like mirror chern number. The order or the name is not important. So for the f electrons, please write 7 random orbitals like px or dz2 or what else you want. 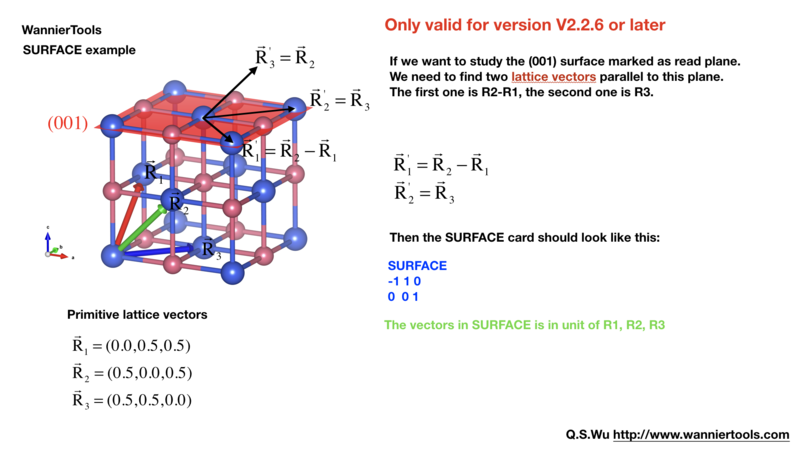 Attention: from version v2.2.6 on, you can specify a surface with SURFACE card with only two lattice vectors. Since this is very confusing, we discard it from version V2.2.6. You should notice that the Miller indices mentioned here are based on three vectors specified in LATTICE card. Choose two lattice vectors on the surface we want to study, and choose another vector which is not on this plane. The slab calculations are base on the surface constructed by vector \(R_1', R_2'\). This is the k path for bulk band structure calculation. These k points are in unit of the reciprocal lattice constant built by the lattice vector LATTICE CARD. The number of k points is Nk1, which is set in NAMELISTS PARAMETERS. There are no default values for this CARD. So you must set some value in the input file when choosing BulkBand_calc=T. The number of lines below “Direct” should be the same as the number above “Direct”. You could add comments at the end of each line. But you can’t add additional comment lines between the formatted lines. This is the k path for slab system. including the band structure calculation and the surface state calculation. It is necessary to set it when SlabBand_calc=T or SlabSS_calc=T. Number of k points along the line is Nk1. 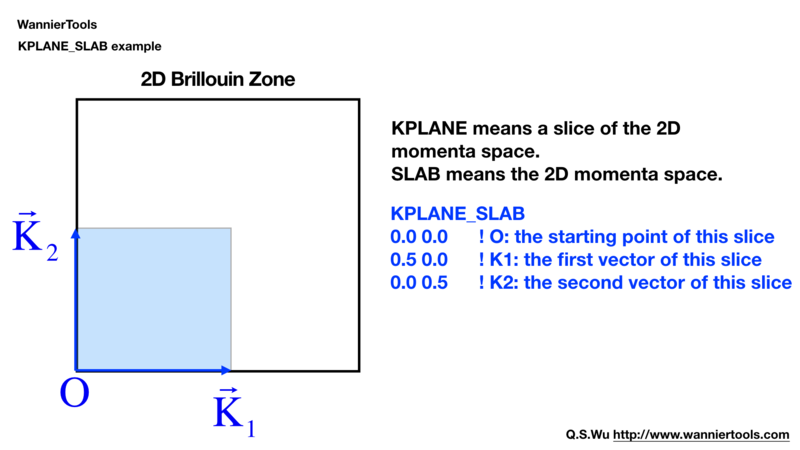 Define a 2D k space plane for arc plots. 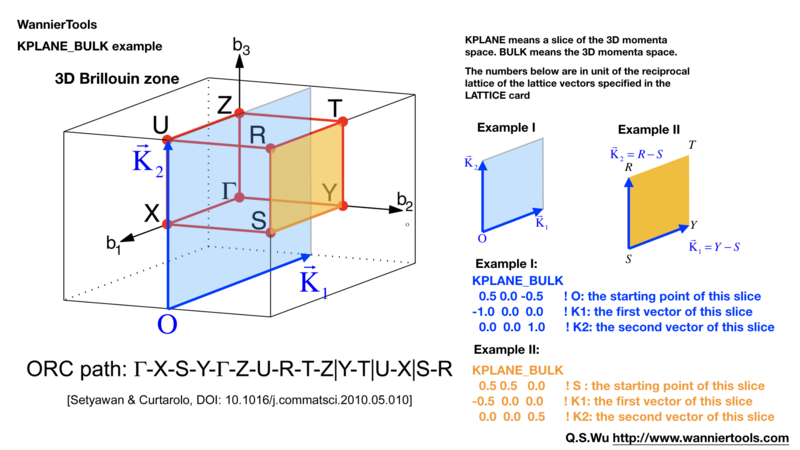 The same set as KPLANE_SLAB CARD, but for 3D case. 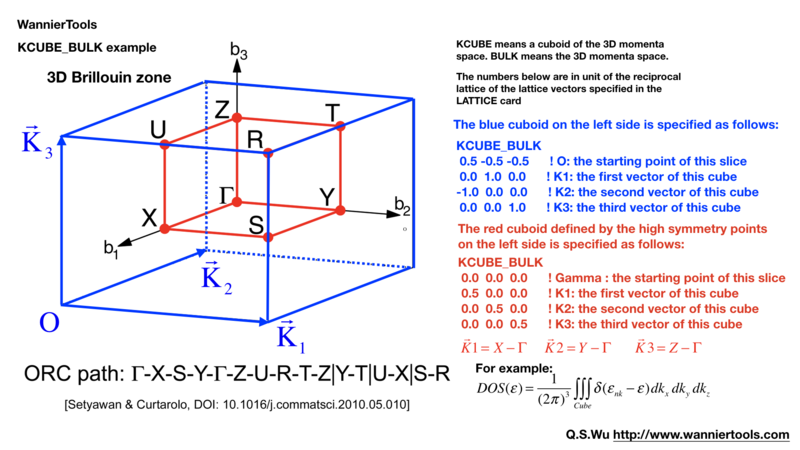 We add another k vector to construct a k cube. Set this for BulkGap_cube_calc=T. The values list above are default values. This card will be usefull for Wilson loop calculations. Those centres can be obtained from wannier90.wout by searching “Final state”. The default values for this card are atomic positions. Now we have one testing version of phonon system, you can write to wuquansheng@gmail.com for testing. There are two steps for using WannierTools for phonon system. 1. Use phonon_hr.py to get the tight-binding Hamiltonian from the FORCE_CONSTANTS or FORCE_SETS which generated with phonopy. This part was written by Changming Yue (yuechangming8 at gmail.com). You can write email to him to get the source. By default the hrfile name of the Hamiltonian is phonopyTB_hr.dat. You can change the name of it as whatever you want. The LO-TO splitting can be treated as a pertubation see phonopy. LOTO_DT is a 3*3 matrix. LOTO_BC are Number-of-atom-types 3*3 matrices. This file contains the TB parameters. Usually, it can be generated by Wannier90. The 1st line is a comment line with any content. This section is about the degeneracy of R points. If you generate wannier90_hr.dat by you self, please set it to 1. There are NRPTS number of 1. This section gives the TB parameters. The first three integers are the coordinates or R vectors in unit of three lattice vectors. The 4th and 5th column are the band index (Row first). The 6th and 7th are complex entities of the Hamiltonian.